On a beautiful day in Autumn I had to go to Bolton Percy, between York and Tadcaster, for a personal meeting with a friend – and with the weather looking so good I couldn’t pass up the opportunity to cycle there and back. I put on my “vest of shame” (a high visibility gilet) and set off at 8am into the bright dawn sunlight, casting a long shadow behind me as I rode. Whether any of the motorists blasting along the country lane were taking care into the dazzling sunshine I’ll never know, on the bright side nobody actually hit me. 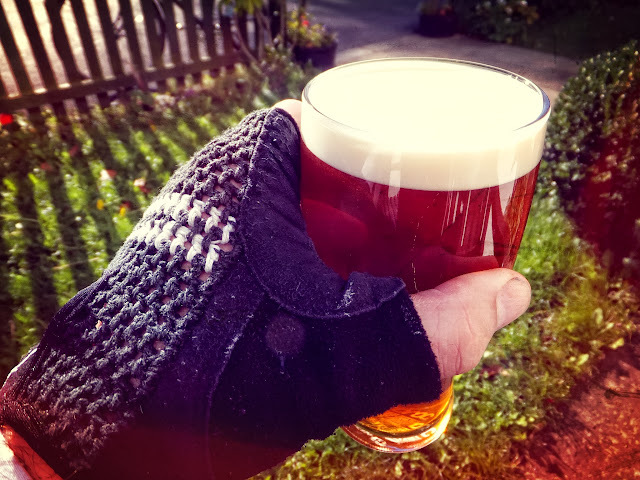 The rewards for being outside on a day like this were worth the effort of riding though. My mind was wandering while I cycled along the old familiar roads to Northallerton, about the route I was going to take, the gift of free time I had to do this ride, and I found myself saying a little prayer of thanks for this beautiful piece of England we can enjoy. Once in Northallerton I realised I’d not brought my wallet with me – which was going to be a challenge if I needed some lunch. I pulled off the road into a quiet lane to call the bank. So a quick call to the bank and I’d arranged to pick up some cash from the nearest branch. Which is in York. So my sketched route down via Aldwark and the old toll bridge was ditched in favour of a main road blast down through Thirsk to York. There was only a light breeze so I found the mainly flat route to Thirsk on the A168, and the mainly flat route from Thirsk to York on the A19, fast and easy. I arrived on the outskirts of York a mere 2hrs 50mins after leaving Ingleby Barwick, and I felt that justified a whoop of delight. It was market day in York so I wandered among the stalls looking for something tasty to eat. The colours and the smells were really delicious and eventually I found one quiet little stall with a sign that read, “Posh Pork Pies – low calorie fat burning snacks.” Too good to be true? I was spoilt for choice with these tasty morsels, and low calories? That did seem like a ‘porky-pie’ as I bit into it. After that rather excellent morsel my gastronomic juices were flowing – and although they were expensive and indeed delicious, I’d burnt somewhere in the region of 2,000 calories cycling down, and my tummy was asking for more. After a brief search elsewhere I found more… in the form of the West Country Pasty Shop at York Station. Hot and lovely, I enjoyed a filling Cornish Pasty and a fresh coffee. Because it was sunny and warm in York, I was surprised to see the Ouse in flood. Several of the riverside properties had the Ouse running 4 or 5 feet up their walls and it looked like a boat had sunk just by one embankment. I wondered if it had been struck by a floating branch and holed in the hold. Cycling out of York I passed Bishopthorpe Palace, the offices and home of the Archbishop of York. Further on there are some very interesting place names such as “Acaster Malbis” and “Appleton Roebuck”. 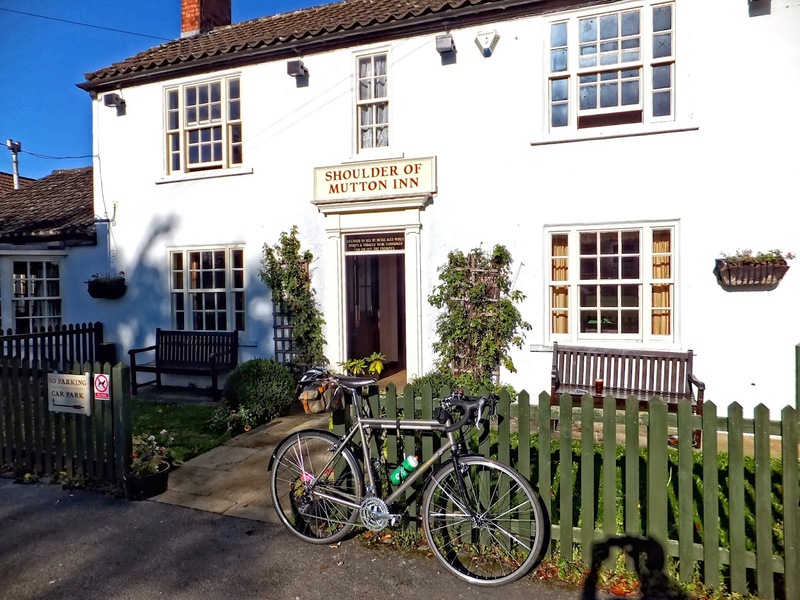 I stopped in Appleton Roebuck for a pint of Sam Smiths in the ‘Shoulder of Mutton’ pub. With 20 minutes before the appointed time for a meeting with my friend in Bolton Percy I finished up, said goodbye to the two lovely elderly women I’d befriended in the sunny garden, and pootled the rest of the way to my goal. Passing this interesting remains of a Windmill on the hilltop outside Bolton Percy. Today though I passed over the top end of the town and followed the breadcrumb GPS track on the garmin device. The poor little device had a horrid day – firstly on the way down I’d ignored it’s pleas that I was off-route… and now on the way back it was frustrated that I was backtracking along the breadcrumbs…”Wrong Way” it kept beeping. I was making my way back to Aldwark and the old toll bridge, so before long I noticed I was also following the roads used on the ‘3 Coasts 600km Audax’ event. The sun was now beginning to drop quite low in the sky and sending long shadows onto the road. I also passed this cricket ground which had an amazingly wide view of the Vale of York. Aldwark Toll Bridge is an interestingly odd thing, the wooden planks which form the roads surface are just laid on the supporting beams, so the planks clatter up and down as cars roll over them – traversing the bridge puts me in mind of cycling over a giant piano keyboard. This evening two things prevented me from taking photos and enjoying it to the full. One: the Ocado van driver had wedged his vehicle into the side of a horsebox as they’d tried to squeeze past each other at the narrow corner… causing a queue of frustrated commuters. Two: I had a puncture. A slow puncture, so I rolled to a convenient looking bench in the late afternoon sunset and raced against the fading light to fix it. Oh how embarrassing, threadbare tyres. The gatorskins were worn through and the inner tube was exposed to the tarmac. Although there was no thorn, the inner tube was leaking out and when I replaced it the new one poked out of the hole in the tyre. I have never had to ‘boot’ a tyre before, and have been known to pour scorn on anyone cheap-skate enough to leave it that late before replacing their tyres. The shame. Anyway, I had some train tickets in my bag, so used the cardboard to ‘boot’ the inside of the tyre and protect the inner tube from the road surface. After inflating the tyre until I heard the reassuring click as the bead settled into the rim I was confident to set off again – on my new “East Coast” version of the gatorskins. The night sky was clear and the temperature dropped quite quickly as the night came in. I rolled into the Tesco garage forecourt at Thirsk and had an “audaxer’s dinner” of a sandwich and a redbull while standing by the commuters refilling their cars with diseasal and gasoline. They were refueling and so was I. It wasn’t exactly gourmet. I must have looked like a bedraggled mess stood there stuffing a ploughmans sandwich down my throat in a little under 2 minutes. However, I was off again and making good time to Northallerton and finally onto very familiar roads though East Roundton and Hutton Rudby back to Ingleby Barwick. It was a dead flat route really, just over 206km covered and only 600m of ascent, mainly in the Seamer hill area. Nice fast blast along the A19 into York too. I enjoyed that in the sunshine. Sounds like a great day out to me Graeme, I would have happily ridden 200km for some of those pork pies. Hope your well, take care Paul Morton. I'll have to let you know next time I plan something fun like this Paul.